Terror group threatens to escalate weekly border riots if it doesn't get $15 million of Qatari money. 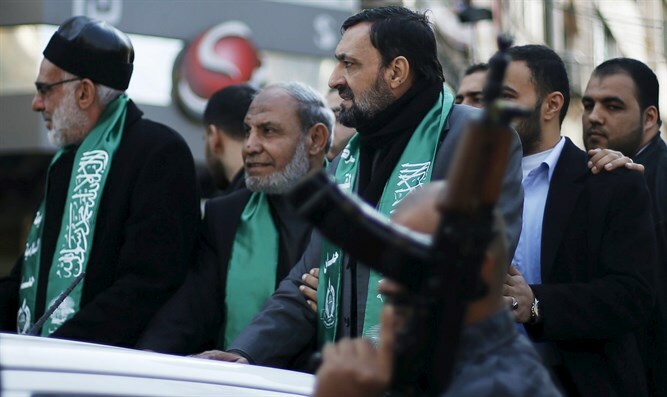 The Hamas terrorist organization has upped its demands for a cease-fire with Israel. According to Hadashot, Hamas wants Qatar to give it $15 million on a monthly basis in order to pay its employees in Gaza..
Hamas head Yahya Sinwar has told Egyptian intermediaries that he will escalate the weekly border riots if the money is not transferred. Israel is considering how to respond to Hamas' new demand. On Friday, at least 40 rockets were fired from the Gaza Strip towards Sderot and the communities surrounding the Gaza Strip. About 10 of the rockets were intercepted by Iron Dome. In response, the IDF attacked some 80 terrorist targets in the Gaza Strip, including a four-story building used by Hamas's security headquarters and a war tunnel. Seven shock victims were treated by MDA teams in the area and two other people, aged 14 and 50, were lightly injured while they ran to the protected area and were treated there. The IDF Spokesperson's Office stated that "the Hamas terrorist organization bears responsibility for everything in and out of the Gaza Strip, and it will bear the consequences for terrorist acts against Israeli citizens." Among the targets attacked during was a tunnel in Khan Yunis, an observation post in Beit Lahiya and two weapons production sites.